Alitalia’s passenger revenues increase continues the growth trend reported in the previous months. The Italian airline reported in January 2019 the fourteenth consecutive month of growth, with a 4 percent increase in passenger revenues, compared to January 2018. The growth was achieved without aircraft fleet expansion and was in particular driven by the excellent performance in the international and intercontinental sectors. In January 2019, passenger revenues of long-haul services increased by 6 per cent compared to the previous year and now represent 48 percent of total passenger revenues, a value never achieved in the last 5 years. 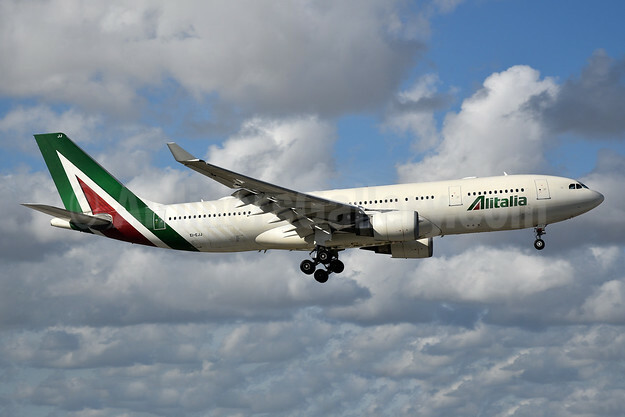 Number of passengers carried on long-haul flights also continues the growth trend: in January 2019, Alitalia carried 197,380 travelers on its intercontinental services with a 2.3 percent increase compared to the same month of the previous year. Top Copyright Photo (all others by the airline): Alitalia (3rd) (Societa Aerea Italiana) Airbus A330-202 EI-EJJ (msn 1225) MIA (Bruce Drum). Image: 104900. This entry was posted in Alitalia (3rd) and tagged Airbus A330-202, alitalia, Alitalia (3rd) (Societa Aerea Italiana), EI-EJJ, msn 1225 on February 11, 2019 by Bruce Drum.